Manipur,IMPHAL, March 3: A mud fort built in the shape of a star has been discovered in a paddy field located at Maklang Bihu Loukon. The place is at a distance of about 15 kilometers westward from Imphal town and comes under Patsoi police station, Imphal West. One has to travel along the National Highway 37 and take a right turn at the police station near HVS brick field. A straight drive towards Maklang and a left turn towards Maklang Makha Leikai and one will reach Bihu Loukon. This IFP reporter went to the spot and saw the mud ramparts which are approximately about 15 feet thick and about 5 feet in height. Each triangular arm of the star shaped fort is about 156 feet in length. The fort has eight arms encompassing a circumference of around 5/6 hectares. A sexagenarian local, Ahongbam Ibomcha identified the ‘pallis’. According to him, the mud ramparts has been there since ancient times and used to be a lot thicker and higher. There was also a long canal where boats were raced. The area is also called ‘Thangapat’ now, but the canal had dried up and was consequently converted to arable land. Interestingly, there is another rectangular mud wall of similar height and thickness with a design of podium stands on each side and located about 200 feet approximately from the star shaped fort. Though much of the ramparts of the outer barrier has eroded with time and farming activity around it, the fort has remained in a much better condition. 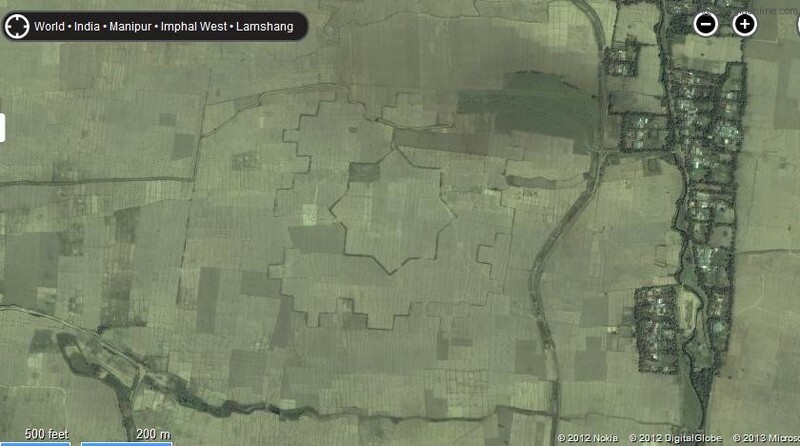 While locals of the area have the usual supernatural stories and taboos, they were not aware that the design of the fort is star shaped, which is obvious only on satellite imagery and not from the ground perspective. “The palli resembles a star”, an astonished Ibomcha quipped to his friends after being shown the satellite image. When IFP met archeologist Nanjesh Thongbam and inquired about the fort, the expert said that the discovery was made about a month back after someone informed the Kangla Fort Board about the peculiar design. The person had seen the shape on Google Earth. Later the archeologist along with another colleague Dr. Okram Kumar inspected the site and gathered information from the locals about the structure. He was told by the elders that the place was ruled by a king called Chakpa Charairongba. 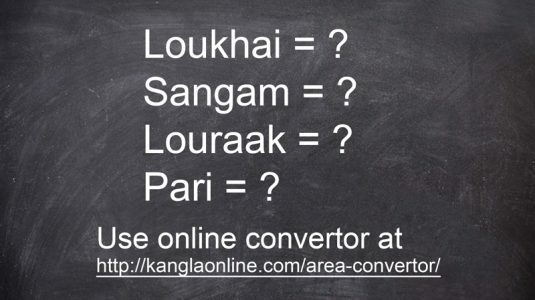 But Nanjesh insisted that the name should be Chothae Charairongba according to reference from Moirang Kangleirol. There were also 7 ‘heibi’ trees planted on the periphery of the fort and supposed to be a manifest of 7 maichous (sages). There are still two trees left. The locals mentioned that those who chopped down the trees met with ill fate and died shortly. Nanjesh said that the star shaped fort may have been built with a military strategy as there are twin mud ramparts of different designs and the area is located with waterways on every direction. He could not verify the age of the fort or the era in which it was built as research is still underway. He said that a technique called radiometric dating will be utilized to confirm the time that the mud wall dates to. “This technology will tell the exact date that the sun first shone on the fresh mud, we can tell the exact date it was built,” he said while adding that the fort must be much older than Kangla Fort as bricks were not used. He voiced his appeal to the concerned state authorities to announce the area of the star fort shaped as a protected historical site. This is not star shape at all. anyone can easily observe,it is the shape of ibudhou pakhangba with the tail in His mouth.